I love caramelized onions. Whether they are on pizza, in pasta, or as part of a salad. The rich, sweet flavor caramelized onions have versus the sharp pungent character of the raw kind, makes them a lot more enjoyable to most people. 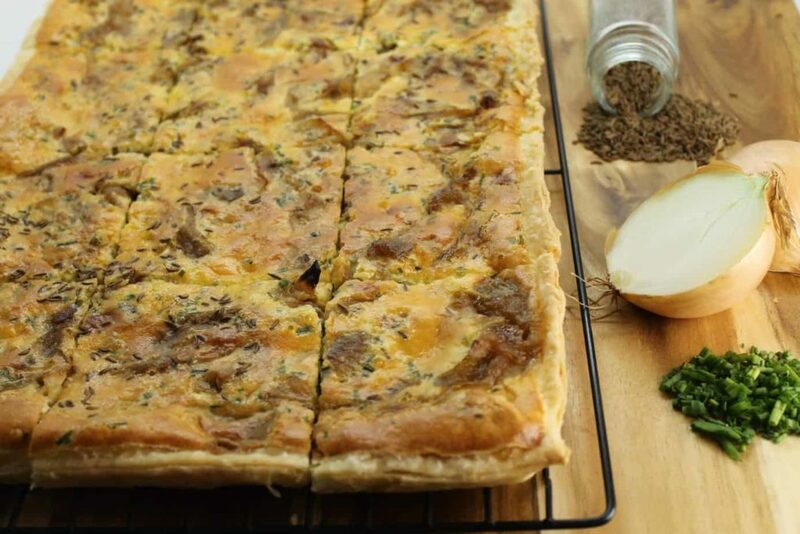 This German Onion Tart, also called a ‘Zwiebel Kuchen; in Germany, is a bacon and caramelized onion tart spiced with caraway and chive. The perfect choice for a quick lunch or appetizer and can easily be reheated in a microwave or toaster oven. It is best served with a simple garden salad and the simplicity of the recipe also makes it the perfect choice as an item for potlucks or family get togethers. 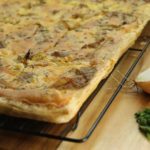 This traditional recipe uses a simple pie dough recipe as a base, after which you simply have to top the dough with the caramelized onions and egg mixture and then bake in the oven until set. This tart is very similar to a quiche, the only difference being that it is not quite as deep and not as heavy as a full blown quiche. When most people caramelize onions, they slice the onions and then saute them over high heat until the start to brown and turn color. This has the general effect that the onions themselves do not fully caramelize and instead take on more of a harsher and burnt taste. This is fine if you are serving them with sauteed mushrooms and steak, but for something more delicate like this tart you want the onions to remain sweet and not burnt tasting. 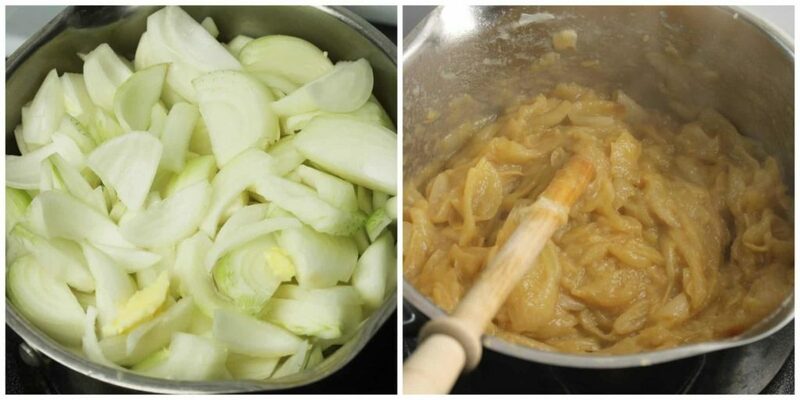 The correct way to caramelize onions is to cook the sliced onions over medium heat. This allows the onions to release their juices slowly and properly cook out. Begin by thickly julienning the onions and placing them in a pot over medium heat with a knob of butter and let the onions caramelise slowly. You will notice that the onions will release a lot of liquid. Keep cooking the onions until the liquid has evaporated and the onions start to turn colour. As the onions cook, you can dice the bacon and prepare this pie dough recipe if you have not made one ahead of time. Chill the dough for at least 30 minutes in the fridge. 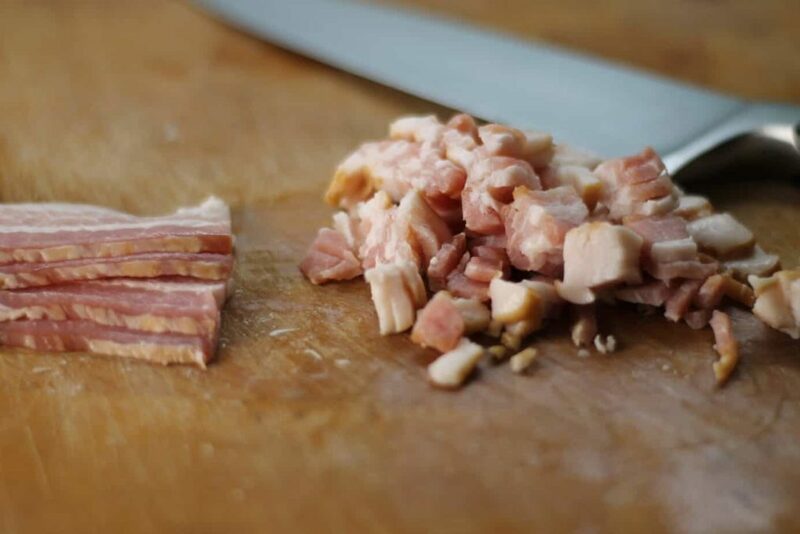 Render out the 100g of diced bacon until it is nice and brown. Strain off the fat and let the cooked bacon cool. By this time the onions should be almost done. If they are not yet dark enough, you can turn up the heat to cook the onions faster, but the slower you caramelise them the sweeter they will stay. Once the onions are caramelized, slightly whip the eggs in a bowl with a whisk. Add the buttermilk, cream half of the caraway and some freshly chopped chives. Season this mix with a pinch of salt and pepper. Roll out the chilled pie dough until it is rectangular in shape and roughly 10″ x 15″ in size. I used a 9 ” x 13″ cookie sheet to bake my tart, so this slightly larger surface area will ensure you have enough dough to go up the sides of the pan. Line the greased pan with the rolled out pie dough, and then trim the edges of the dough with a sharp knife to create straight lines. Evenly spread out the caramelised onions and bacon on top. Pour the mixed egg and cream mixture over top of the onions. Bake the German Onion Tart for 325F for about an hour in the oven. Once the top of the onion tart is nice and golden brown, remove the caramelized onion tart from the oven and let it cool on the counter. After about 15 minutes, remove the tart from the pan and finish cooling it on a wire rack. 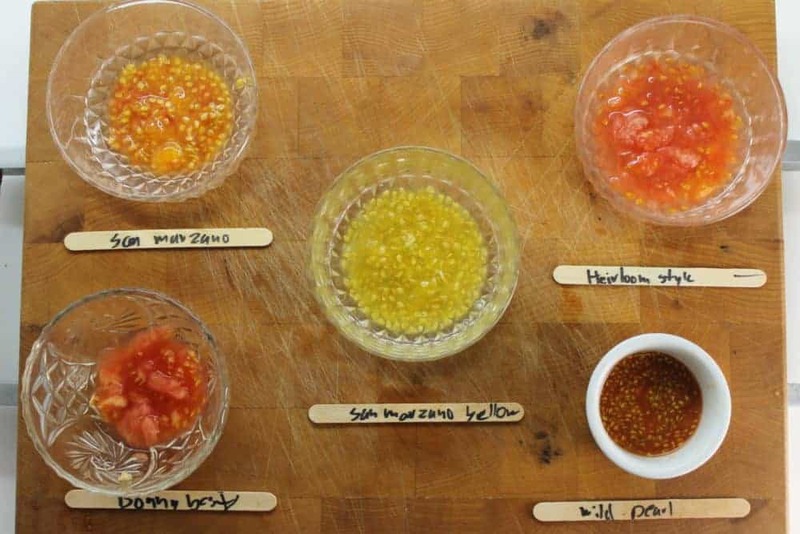 This helps prevent the bottom of the tart from getting soggy, and keeps it nice and crisp. Serve this delicious tart with a side salad for a quick lunch or light supper. 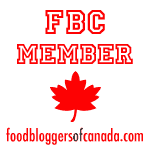 Make sure to follow me on Facebook, Instagram and Twitter, to catch next weeks blog post! If you loved this German recipe, try out some of my other traditional German foods such as this Hearty German Goulash, Real Spaetzle Noodles, or my Grandmothers Apple Pie! 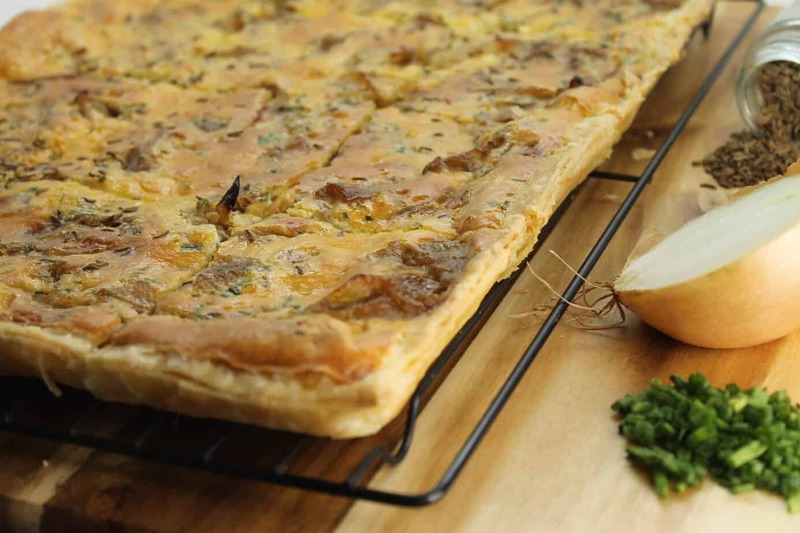 A deliciously simple caramelized onion tart. The perfect treat to make for a quick and easy lunch or an appetizer. Serve with a simple green or garden salad. Begin by thickly slicing the onions, julienne style. Place the onions in a pot with the butter, and cook over medium heat until caramelized. About 1 hour. Once the onions are on the stove dice the bacon and render out all the fat, setting both aside. The fat can be used to brush the tart pan later before lining it with the dough. Make 1 x 9" pie dough recipe ( you can find a recipe on the blog here, or use a store bought one). Brush a 9" x 13" cookie sheet pan with butter or the rendered bacon fat, to prevent the dough from sticking to it. Roll out the chilled pie dough and line the pan with it, making sure the dough comes up the sides of the pan. Using a sharp knife trim the edges to create even straight lines/edges. Spread the caramelized onions and rendered bacon evenly over the dough lined sheet pan. Mix the eggs, buttermilk, cream, and half of the caraway and chopped chives in a mixing bowl with a whisk. Pour this mixture over top of the partially filled tart. Sprinkle with the rest of the chives and caraway. Bake the German Onion Tart at 325F for about 1 hour in the oven, turning it halfway through to ensure even cooking. Once the Tart is nice and golden brown on top, remove from the oven and cool on a wire rack on the counter. Oh my!!! This sounds spectacular!!! I am thinking I may try the topping on a puff pastry crust, I have some in the freezer I want to use up. Thanks Markus, I can’t wait to try it. 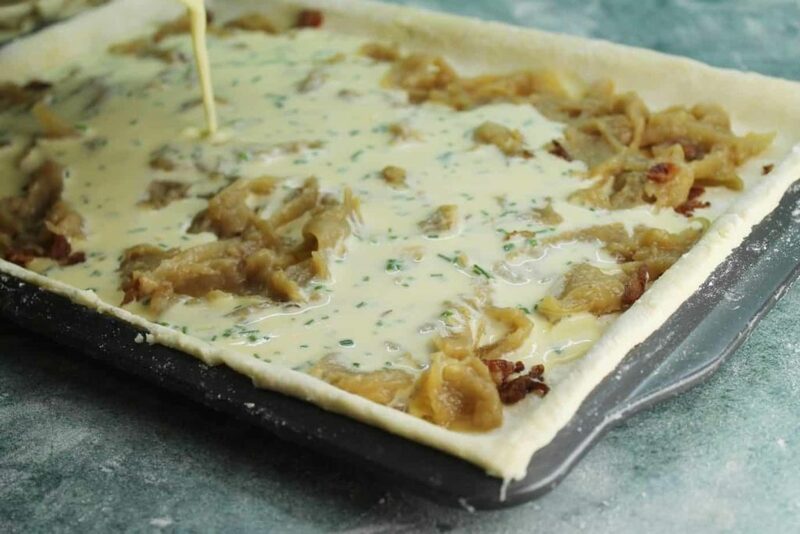 I haven’t seen an onion tart with a pie crust before – it looks like the perfect vehicle for all that onion-y goodness! Your right it is usually made with a yeast based dough. I thought this would be a simpler way to make it and prep ahead! This looks WOW! My German husby is gonna flip when I’ll cook him this! Thanks for sharing!